As promised more character sketches, there are so many! I guess I had a lot of fun with these though I suspect I should not have drawn every little bit-character I decided to give a name. 2013 was my last glut of fictional character portraits. A few stragglers have appeared as time has marched on and I am sure more might appear in the future. Not quite as many in this post as the 2012 Fictional character post but I will still drip-feed them as best I can. Above we have a re-imaging of Jet (top left) who is based on my husband and also top right the character my mother-in-law invented. Top right then is a character named Bea who is based on a polar bear. 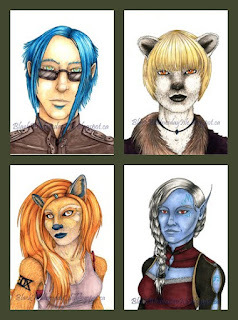 The lower two are a fox named Sable (left) and a drow (dark elf) named Alanor (right) who is the aunt of Tomor O'Mahryn. I thought Alanor was important to draw because she is the sole female figure in Tomor's life and Tomor, despite being a terrible romantic, does play quite a large part in my narrative. Above are two characters that were created in words by friends of mine. Both have separate forms they can transition into. The top character named Nico is pretty much an atypical lycan. 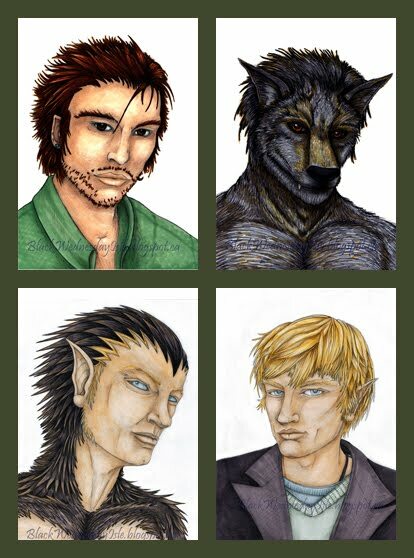 He is a wolf lycan but there is nothing in my narrative that fits the werewolf stereotype of changing into a wolf upon a full moon. Nico can alter his shape to be the right hand wolf form as he chooses, no moons involved. The bottom character is named Aeric and he is what we call a Fachin. 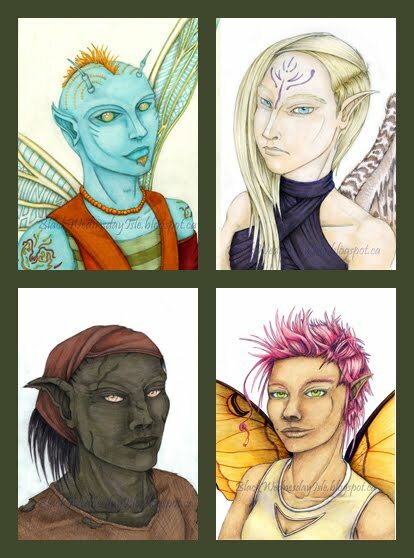 This is one type of fae in my narrative. 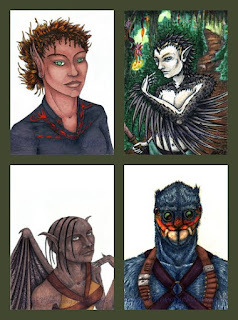 This particular type of fae are able to grow feathers, or rather a feathered mane. If you want a better visual reference for this just think of Howl from Myazaki's film Howl's Moving Castle. Last up for this entry we have a mostly fae allotment. 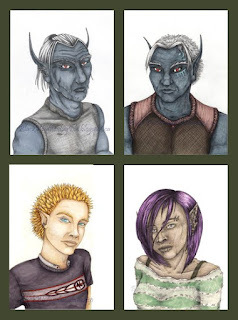 Top right is Nenigin, he is brother to the ludicrously red Naiad and also visually based around a damslefly. 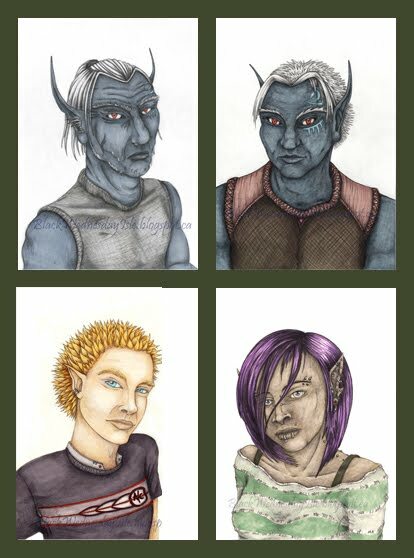 Bottom left is not a fae but rather a goblin named Hite (Hee-tay in pronunciation) Again I designed the ears to help differentiate species. Last up then are top right Dhei (day in pronunciation) and lower right Karyf. These two are both fae of different types. Dhei has bird wings as opposed to insect wings and the two are devilish together!